Ruby Elda (Schultz) Rutherford, 96, Perry, went to be with her heavenly father, at 6 a.m. Sunday, November 11, 2018, at the home of her daughter, Linda Luthye. Ruby was born October 21, 1922, in Ames, Oklahoma, to Peter and Katherine Schultz. She was one of 12 siblings. 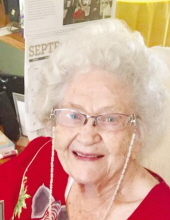 Ruby received her education grades one through eight at Westlawn District 12, Noble County, and graduated from Billings High School in 1941. She was the only member of her family to graduate from high school. After high school, November 4, 1941, she married Rufus J. Rutherford in Perry. They were engaged in farming until 1948 when Rufus was employed by Warren Petroleum Company. Ruby worked 12 years in a restaurant on the south side of the square. She also worked two years in the Perry School cafeteria. Her husband was transferred to Sapulpa where she worked seven years in the Bartlett Hospital as dietetic assistant and food service director and four years at Sapulpa schools as secretary to the food service director, retiring in 1984. At that time, they moved back to Perry. Ruby was a very gifted and talented artist, painted pictures, on such things as saws, boards, gourds, etc., and gave to members of her family. As Christmas presents for their family, her husband would create gifts and she would paint them. They are cherished by her family members. She was a founding member of Perry Assembly of God Church, where she taught Sunday School. When she could, she loved working in her yard. When she became unable, she sat outside and directed her daughters, Linda and Marie, in what to do. She was known as a good cook and visitors never left her home without eating something. A celebration of her life will be held at 1 p.m. Thursday, November 15 at the First Baptist Church, with Rev. Brett Nation officiating and her son Rev. Dr. Lonnie Rutherford assisting. Public viewing will be held from 8 a.m. to 8 p.m. on Wednesday at the Trout Funeral Home Chapel, with family greeting friends from 5 to 7 p.m. She will be laid to rest in Sample Cemetery, northwest of Lucien. She is survived by her six children, four sons and two daughters: Marie Oliver, and her husband Larry, Norman; Harvey Rutherford, and his wife Lanette, Woodward; Larry Rutherford and his wife Donna, Enid; Rev. Lonnie Rutherford and his wife Iona, Billings; Linda (Rutherford) Luthye, Perry, and Stan Rutherford, and his wife Sheryl, Newark, MO; 19 grandchildren; 40 great-grandchildren; and eight great, great-grandchildren. Also, her brother, Pete Schultz, Billings, and nephew Melvin Schultz, Sapulpa, who was reared as a brother; and sister-in-law, Reba (Rutherford) Chastain, Perry; numerous nieces and nephews. In addition to her husband Rufus, she was preceded in death by her parents; 10 siblings: Elbert, Walter, Harry, Lester, Lewis, Irvin, Irene Montgomery, Mable Parker, Magdelena Beckner, Vivian Rutherford (sisters married brothers); daughter-in-law, Shirley Jean Johnson Rutherford; son-in-law, John Luthye; sister-in-law, Lucille Schultz, and two grandchildren, Sara Faye Rutherford and Shelby Harris. To send flowers or a remembrance gift to the family of Ruby Elda Rutherford, please visit our Tribute Store. "Email Address" would like to share the life celebration of Ruby Elda Rutherford. Click on the "link" to go to share a favorite memory or leave a condolence message for the family.